Although private consumption weakened, with retail sales posting a -1.5% sequential contraction in 1Q18 vs 4Q17, the trade deficit continued to widen in March, likely due to the effect of Easter. This suggests structural competitiveness issues on items such as food, as a slowdown in consumption is yet to have a visible impact on the trade deficit. 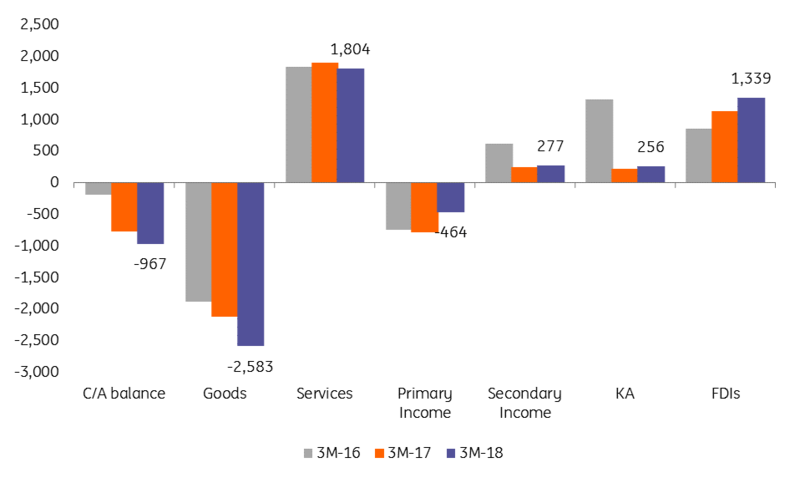 There was an improvement on the primary income suggesting that the deterioration last year was triggered by one-offs after the cut in the dividend tax. On the negative side, the surplus on services shrank by 5.0% YoY in 1Q18. FDI surged by 18% YoY in 1Q18 which should provide some optimism for the currency outlook. While there are some encouraging developments on the external position, it is too early to say that the deterioration is now in reverse, especially given that there is no reason to expect a meaningful fiscal consolidation. Still, the Romanian leu seems somewhat protected by higher carry.